Adopt a comfortable posture with the spine as nearly straight as possible and the eyes open or half-closed. Form a specific intention for your period of prayer. Persist in this for whatever time you have decided, I recommend not less than ten minutes and not more than forty-five. Finish with a Salve Regina/Hail Holy Queen and offer your thanks to God. There is nothing mystical about the posture. Its designed to be comfortable enough to hold for a reasonable length of time without being so comfortable that you fall asleep. If you prefer kneeling to sitting while you pray then do so. The intention transforms your action from a solitary one to a communal one. If you intend the spiritual benefits of your prayer to flow to the needs of the world, or the Church or your loved ones then it is not all about you. If your intention is to be strengthened in virtue then, again, the chief beneficiary of your good acts will not be yourself. Saying the prayers of the Church is not only a good thing in itself but, psychologically and physiologically it provides a bridge between whatever you were doing before to what you are about to do. It allows your body and mind to relax into their new activity. Jesus is the breath of life to us so invoking Him with our inspiration makes good sense. Mary is our mother, our fellow pilgrim, our good companion, so sending our respiration up to heaven with her for company also makes sense. Again the prayers at the end are good in themselves and, in the case of the Thanks Be To God, necessary, whilst also acting as a useful bridge. As soon as you try to keep your mind focussed and your body still both of them immediately revolt and seek to through you off course. As far as the body goes you are likely to break out into itches and aches and pains combined with a need to convulsively swallow every few seconds. Of the two, body and mind, this is probably the easier to overcome. When you feel the need to scratch, change position or swallow don't try to ignore it or to resist it heroically. If, in addition to paying attention to your breathing and the names of Jesus and Mary you just direct your mind towards the part of the body most affected and, as it were, mentally observe it then the feeling will likely pass away fairly quickly. If not then change position and settle down again. In my experience this bodily restlessness stops being an issue after a fairly short period of regularly praying this way. The mind is a much trickier proposition to deal with. Distracting thoughts race through it almost all the time and you begin to engage with them and get led away into wondering what to have for lunch or who's going to win the World Series or the wonderful thing you are going to do the moment you stop praying or whatever. There is nothing you can do to prevent thoughts arising so don't try. Focus as much as you can on your breathing and on the names of Jesus and Mary. When you notice that you've engaged with a thought don't get irritated or resolve to do better next time. Just gently let it go and resume your focus until the next time. Unlike the challenge from the body this distraction is likely to be with you for the duration so just live with it and do the best you can do. No method or form of prayer acts like a magic bullet in and of itself. In order for it to be effective in a spiritual sense, whatever it might do for us therapeutically as a stress reliever, it needs to be accompanied by a right intention on the part of the person praying and a free act of grace given to us by God through the hands of Mary. Moreover, even if those things are present prayer on its own does not constitute the spiritual life, it needs to be accompanied by a participation in the life of the Church, her sacraments strengthen us, her liturgies teach us, her Sacred Scriptures refresh us, and our fellow members in Christ need our charity as we need theirs. Granting all these things what spiritual benefit can we hope for from this method of praying? This is something that will vary from person to person so really the only way to find out for yourself is to do it for yourself. Decide that for a period of time, a month maybe or three months, you will set aside half an hour or so for at least six days every week and pray in this manner and then you will be in a better position than I am to answer the question. The question of outcome though is linked to that of right intention which I mentioned above. The aim is to focus entirely on the love of God who has come to us, through Mary, in the person of Jesus Christ. We cannot be unmindful of the details of His life, particularly His Passion, Death and Resurrection, but these are present to us implicitly in His sacred Name as are the other two persons of the Trinity. They are present also in the name of Mary who stood at the foot of the Cross on Golgotha and who is the daughter of the Father, the spouse of the Holy Spirit and the Mother of the Son. Our purpose though is not to call any of these things explicitly to our conscious minds but simply to place ourselves in the presence of this divine love expressed in incarnated form through Jesus and received and lived out most perfectly in Mary. And having placed ourselves so we simply wait for that seed to grow in the way and at the pace that the good God decides is best for us. We travel in faith towards love sustained by hope. And then we will know. 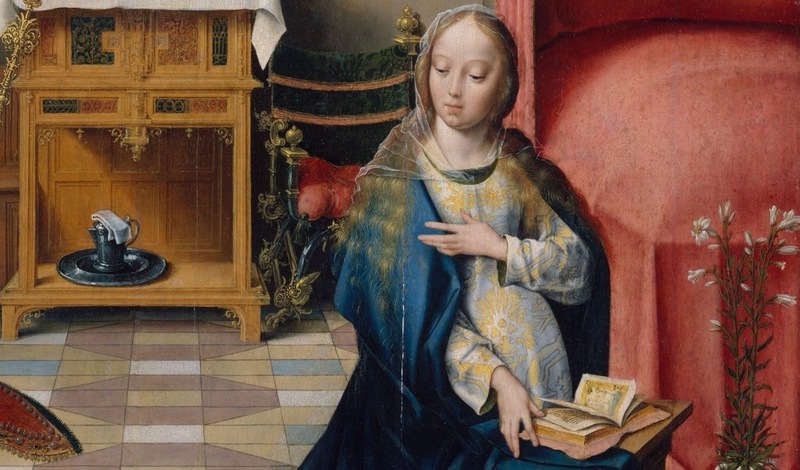 When the Solemnity of the Annunciation coincides with Eastertide it invites us to consider the great mysteries together. Pre-eminently the Word of the Father is the Son. That Son went forth from the mouth of the Father and became clothed in flesh the moment our Lady gave her glad consent. Before, at the Ascension, He returned to His source the Word experienced the flight into Egypt, the hidden life in Nazareth, the mission in Galilee, the betrayal, abandonment, torture and death of the Passion and the Easter resurrection. All of which constituted, as Isaiah foresaw, a carrying out of the will of the Father, voluntarily undertaken, and an achievement of His purposes using the weapons of humility and seeming defeat. This all was the work of the Triune God Himself. Father, Son and Holy Spirit are each involved essentially in everything that makes for Man's liberation from the dominion of darkness. It has never been, however, God's way with His free creatures, Men and Angels, to act alone, without their participation in their own emancipation. Before the Son, as Man, could begin to do the will of the Father on earth Mary, as Woman and as our representative, had first to make that precise same choice- voluntary obedience to the Father's will. The Lord God is no tyrant therefore He uses His strength with restraint and as a Father not like the pagan gods who were understood to be capricious, deceitful and without restraint of any kind save that imposed by other gods. It is because God's nature makes human co-operation a necessity for human redemption to be achieved that we can speak of the particular human, Mary, whose co-operation was most necessary as a co-redeemer with Jesus. There is of course only one redeemer, Jesus, and one redemption, through His crucifixion and death, yet without Mary's fiat mihi there would have been no flight into Egypt, no hidden years in Jerusalem and, above all, no Passion, Death and Resurrection. The Father's Word went forth and returned successful not only because it was spoken by Him but also, and crucially, because it was heard and listened to by the Blessed Virgin Mary.